The aggressive opening combo of Jonny Bairstow and David Warner performed a destructive duet as Sunrisers Hyderabad heaped tonnes of misery on a listless Royal Challengers Bangalore here on Sunday. 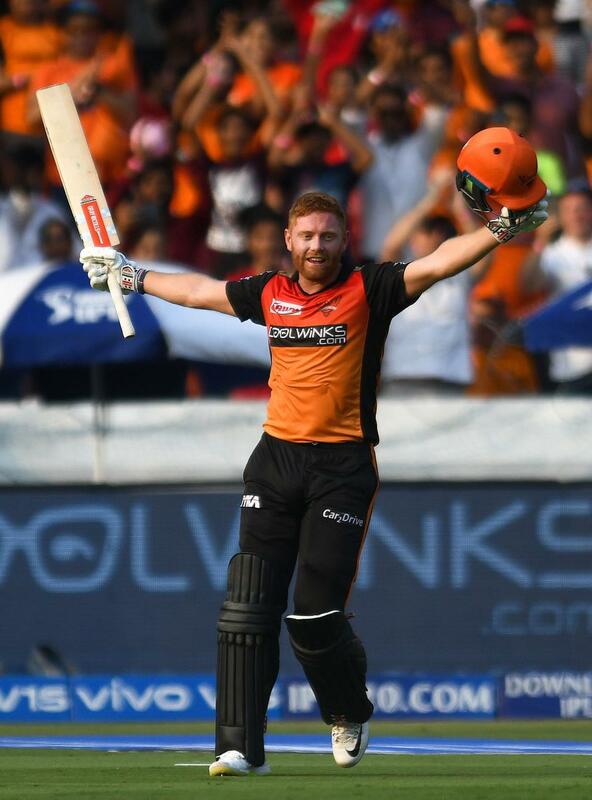 While Bairstow, playing with his foot on the pedal from the word go, slammed a breath-taking 56-ball 114 (12x4, 7x6), Warner, unusually operating on third gear for most part of his innings, still managed to hit a 55-ball 100 (5x5, 5x6) as the Sunrisers rode on their record-breaking 185-run stand to post a humungous 231/2 at the Rajiv Gandhi International Stadium. Chasing the highest total of the season and the biggest at the RGIS, the shell-shocked Royal Challengers needed an exceptional performance to scale the monstrous mountain. But with the top-order yet again misfiring and the confidence in a shambles, the visitors ended up being bowled out for 113 to suffer a massive 118-run defeat. Yet to open their account, RCB stay rooted at the bottom of table while Sunrisers rose to top with six points. Bairstow and Warner meant business from the word go on a flat track and against an insipid RCB bowling. Englishman Bairstow decided to set the pace with a blistering attack on the RCB bowlers, all of whom struggled to get their lines and lengths right amidst the sensational assault. This just made life easy for Bairstow, who simply kept going at a strike rate of almost 200 without having to take a risk. While Bairstow was going great guns at the other end, Warner relied more on his ultra-quick running between the wickets. He did keep pulling off the big shots every now and then to show his pedigree but was happy to concede the centre stage to Bairstow for most parts. Englishman Bairstow barely gave respect whatsoever to any RCB bowler, particularly harsh on two leg-spinners — senior Yuzvendra Chahal and 16-year-old debutant Prayas Ray Barman. While Chahal went for 44 runs for Barman it was a baptism by fire as he was taken to the cleaners, conceding 56 runs in his four overs. Whoever Virat Kohli summoned in a bid to break the stand kept getting hammered badly. Kohli’s only hope was a miracle and that never happened as Bairstow and Warner kept breathing fire, much to the delight of the Orange Army who had thronged the stadium a good two hours before the kick-off despite the mercury levels touching 41 degree Celsius. Bairstow brought up his ton in the 16th over and leapt in the air Warner-style. Bairstow and Warner not only broke the highest opening-wicket partnership record in IPL by a run but they also became the first pair to post three consecutive 100-plus stands. The spotlight was then on Warner on whether he would be able to touch the three-figure mark and he did so in the last over to receive a raucous appreciation. RCB batsmen, on the other hand, appeared like rabbits caught in the headlights. The big two — Kohli and de Villiers — made just 3 and 1 respectively and the rest, barring Colin de Grandhomme (37), showed no stomach for a battle. Afghanistan off-spinner Mohammad Nabi lured RCB batsmen to their doom with a 4/11 show and with the visitors reeling at 35/6, there was simply no hope.